It’s a good job it’s spring with light mornings as this is helping us to wake before the alarm goes off each morning. 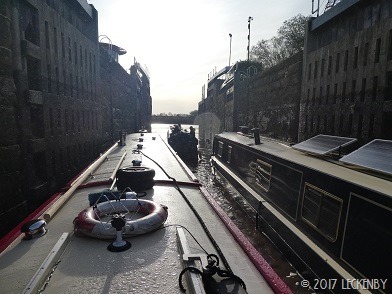 Today we needed to be up and ready for the off by 7.30am, we were ready and waiting when the lock light turned green. The Lock Keeper came over to check everyone was okay and where we were all heading to, all three boats were hoping to reach Cromwell today. With an early start and a high tide it would be possible, but we all had the idea that if we’d had enough we could stop at Torksey for the night. 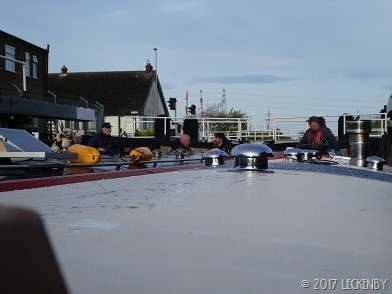 Once the road swing bridge was open we pulled in to one side of the lock, NB Lazy Jayne the other and then NB Anchor Management slotted themselves in between us both. There was lots of chat going on as the water started to be emptied out of the lock. Then shouts from the chap on NB Lazy Jayne, he thought that his rope was caught and his boat was starting to list. Everyone shouted and Mick bipped our very loud horn to alert the Lockie. The paddles were dropped and the boat sat at quite an angle, it wasn’t the rope, but it was hung up on something. Then whatever had held it gave way and the boat righted itself with a jolt. It was a horrible feeling for us, never mind for the couple who owned it! Everyone was okay, no time to have a restorative cuppa, the tide wouldn’t wait. NB Anchor Management led the way and we brought up the rear of our flotilla. 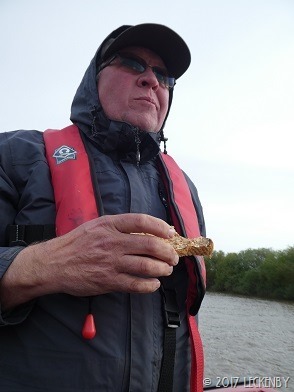 We’ve been out of Keadby once before back in 2015 when the Trent was a mill pond and we got sunburn, today there’d be no sunburn just windburn. 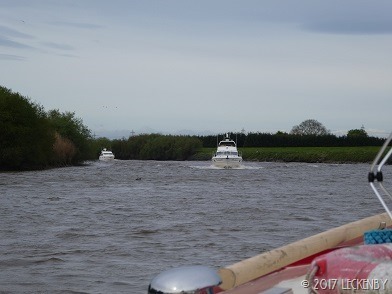 Having said that there were moments where the river was wonderfully calm, but then a bend would take us straight into the wind and white horses faced us. 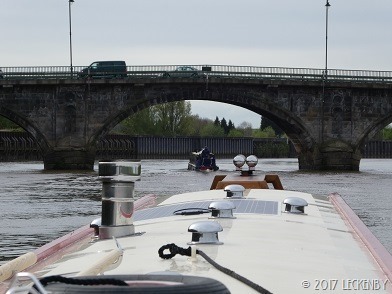 Before the A18 bridge NB Lazy Jayne passed NB Anchor Management then soon after the bridge they waved us past. 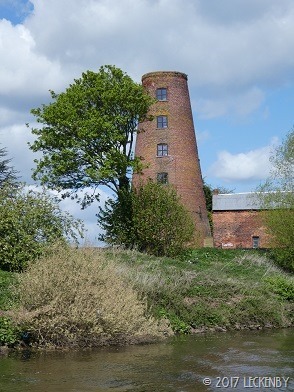 The last we saw of them was around Owston Ferry. 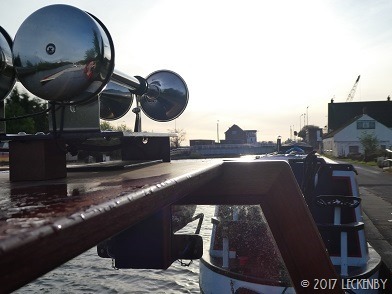 Our VHF radio sprung to life as two cruisers came into view ahead, they were informing each other of our presence and both slowed down. Downstream of Gainsborough there isn’t a speed limit so they had both been ‘riding the plane’. Their wake was the biggest we’ve ever encountered, hitting it with the bow of Oleanna had spray coming onto the roof. It was like the end of an episode of Hawaii Five O! It really is a good job I’m not prone to seasickness! As soon as they felt they were at a suitable distance they opened the throttle back up and sped away. Their wake continued for quite sometime, keeping us bouncing around, listening to the prop in the changing water for a good 15 minutes. Then turning round one bend the water calmed down again. 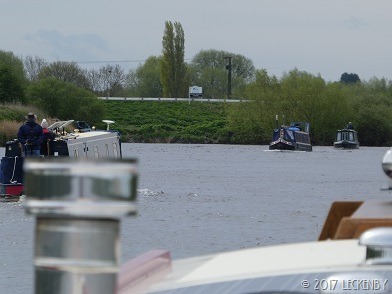 At West Stockwith a cruiser came out from the lock surprising NB Lazy Jayne, both boats slowed down and then the cruiser crossed in front of us and headed towards Keadby. A mile further on and we’d reached the halfway point to Torksey. We’d been told that if we reached Torksey between 11.30 and 12.30 we’d be fine to reach Cromwell, we were well on track. The channel through Gainsborough gets quite narrow, this has the effect of speeding the incoming tide up. Mick checked his speedo ap on his phone, we were doing 9mph. Good job there were no moored boats about! Approaching Torksey we decided that we’d continue, NB Lazy Jayne carried on too. 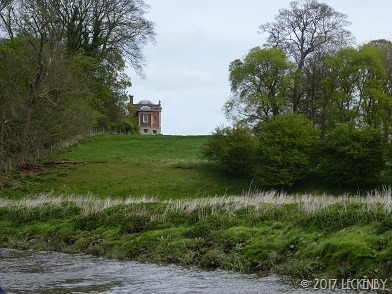 From here we kept a closer eye on our Trent charts, sholes, sunken islands hide waiting to catch you out, although with the depth of water we now had we were unlikely to have any problems. 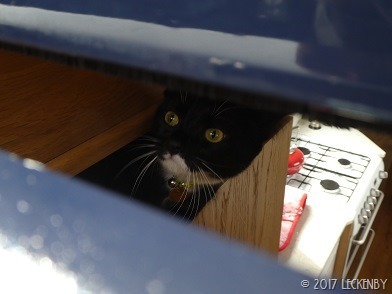 One problem we did have was as I opened the hatch to go below, Our second mate had decided to elevate her cruising position and sit on our Nicholsons shelf, it’s a tight squeeze, but the highest feline position in our new inside. At about 10km to go the tide stopped coming in, it just stopped. Our speed had already dropped, but now we pootled along. With 5km to go I noticed a cruiser behind us, then another. 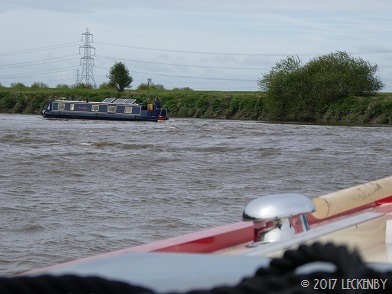 They both sat patiently behind us as the river bends a lot along the last stretch before Cromwell and we’d all end up sharing the lock anyway, so why hurry. 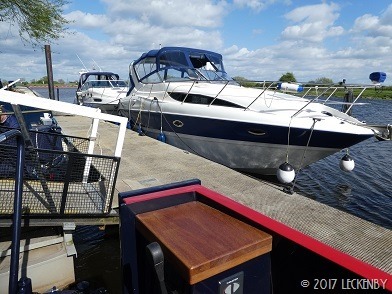 The cruiser that pulled in behind us in the lock was Naughty Cal, we knew we’d come across them today as they had come down Torksey Lock at lunchtime. So Mick had a chat as I tried clinging on for dear life at the front of Oleanna. I strongly suspect Cromwell lock has grated off some of the paint on our rubbing strips! Oh well it was going to happen sooner than later. There was space for us on the inside of the pontoon as well as NB Lazy Jayne. 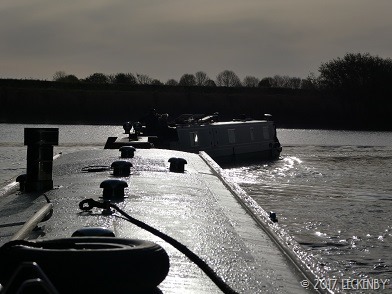 We were all moored up almost a day ahead of schedule by 2.45pm. Today is the furthest we’ve ever travelled by narrowboat in a day, so a record for us. Mick walked to the local shop (A1 service station) for our Saturday paper and some milk, NB Anchor Management was just coming up the lock almost two hours behind us. 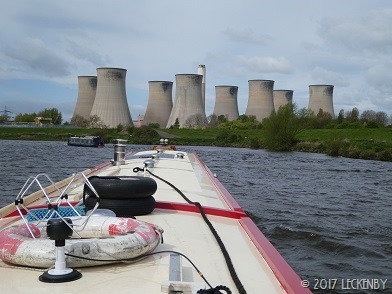 2 locks, 44.34 miles, 1 swing, 2 close for comfort, 2ft waves, 7 going that way, 2 slices Tidal Trent Toast, 9 mph, 1 ski jump, 2nd mate being cheeky, 1 blogging boat, 3 cruisers on the outside, 1 thin bow rope, 1 bad grip, 1 sunk yacht, 2 hours behind, 2 racing boats, 2 red wind burnt grinning faces. This is a dual post with NB Lillyanne’s Blog. Our blogs will be changing, as we now have built our boat and NB Lillyanne will be up for sale in a few weeks. We’ll let you know what is happening once we know. This entry was posted in Uncategorized on 15th Apr 2017 by pipandmick. make that 3 grinning faces, that was brilliant. \” he thought that his rope was caught\”-omg my whole body went tense as I was reading that, I think I'm an extreme case of Empathetic. It may be the way you write, Pip, but I'm right there with you on the river, even while I'm sitting in my slippers in the conservatory.